ESPAÑOLA, N.M.—Five years ago, Wendall Barnett was mad. Mad as hell. 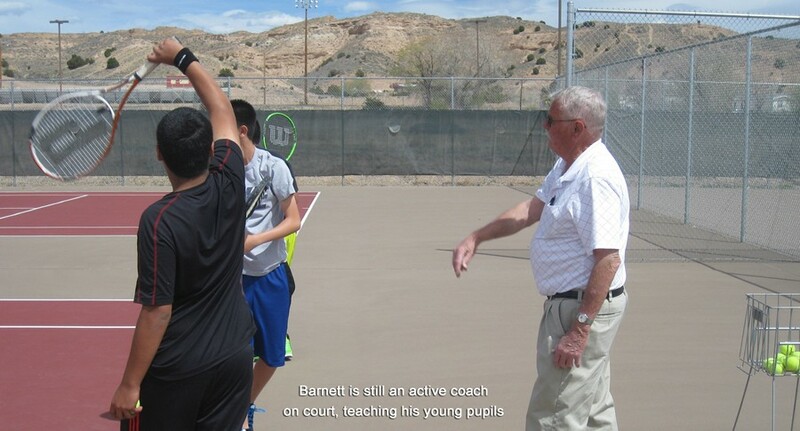 Then 82 years old and the coach of the boys’ tennis team at Española Valley High School, Barnett was one of the oldest active head coaches of any prep sport in New Mexico. He was easily recognizable in this little, mostly Hispanic community 25 miles north of Santa Fe. Tall and stout, he had the moustache of a whaling-ship captain and the laugh of a cannon’s discharge. He was not laughing the day we met. For a decade and more Barnett had pushed—unsuccessfully—for funds to redo the eight tennis courts at EVHS. The surfaces of those courts did not have cracks. They had six-inch-deep craters. Players worried not about stubbing toes, but about breaking legs. The few windscreens hung in tatters, the fences sagged badly, the lines on the courts nearly invisible. This wasn’t an athletic facility. It was a bombing range. 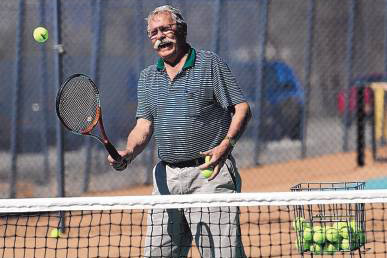 Española Valley had not played a home tennis match in ages. “It’s embarrassing what has happened to these damn courts,” Barnett told me that spring afternoon in 2009. 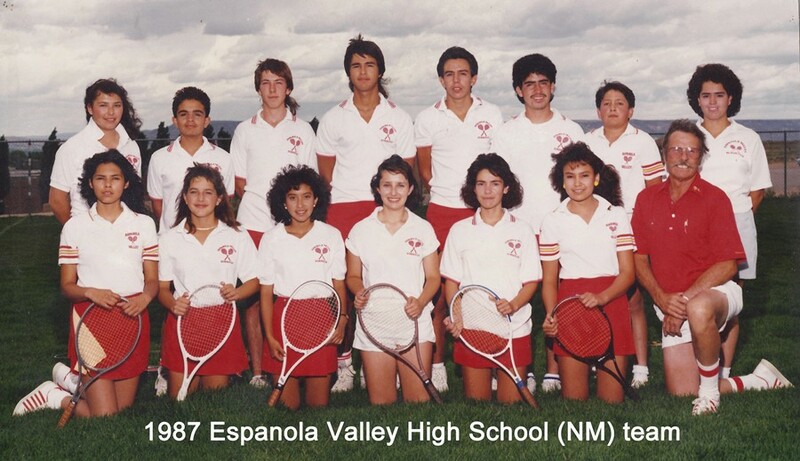 Barnett, who began coaching tennis at Española Valley in 1987 (that team pictured below), for the first time was considering retirement. Happily, Wendall Barnett is still coaching at Española. He is still teaching kids to crack a serve and to take the net on a short ball. Most important, he is forever telling young players to go to class, study hard, stay off drugs, keep out of trouble. At 87 years, Barnett is the same age that baseball Hall of Fame manager Connie Mack stopped patrolling dugouts in a business suit. Barnett has a ways to go to catch Amos Alonzo Stagg, who ceased tutoring college football players at 96. Don’t bet against Barnett making it, for he has no interest now in retiring. The reason? 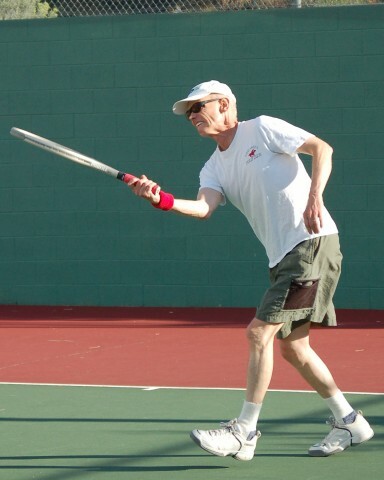 The eight tennis courts at Española Valley High School were resurfaced—finally!—in 2011. Not only that, new and better windscreens and fences were added. General obligation bonds through the school district made it happen for approximately $360,000. The X factor in all of this is Barnett’s health. He has battled bladder cancer for nine years. That adds up to a slew of uncomfortable cystoscopy preocedures and delilitating chemotherapy treatments. Suffering from blocked arteries, three stents have been placed in his heart. “I can still get out there with the kids, but I can’t run around the court anymore,” he says. Española, N.M., has never been a tennis town. The high school has never been a hotbed for turning out future stars. There is no country club in Española, no age-group instruction for young hopefuls, no feeder programs. Ranchitos Park, the city’s biggest playground, has long had some tennis courts, but they’ve been unplayable for years. “They might as well turn that space into a parking lot,” Barnett says. What this means is that Barnett consistently gets players as freshmen who have never played the game and don’t know the rules. He has only three or four years to work with boys, whereas typically a junior competitor has had half a dozen years of tennis before enrolling in high school. Basketball is Española’s passion and always has been. As popular as that sport is here, it also generates ferocious expectations. The boys’ basketball team, the Sundevils, have won only one state title in the dozens of years they have played. That championship came in 2011. And yet the coach, Richard Martinez, instead of being held up as a prince, is to many a pariah. The residents believe the team should win state every year and of course that doesn’t happen. Some irate fans one year grew so enraged at Martinez they attempted to burn down his house. That high school tennis courts are much better these days that hardly solves the woes of Española. Poverty is a part of life here. The per capita income for the town is $14,303. Two imposing, glittering casinos yield some local jobs, but few residents get wealthy in sprawling Rio Arriba County. Out of his own pocket, Barnett regularly purchases rackets and strings them for players. Then there are the drugs. A few years ago, Española led the nation in drug overdoses. Nancy Suazo, who coaches the girl’s tennis team and teaches math at EVHS, says marijuana can be found everywhere and heroin is making a comeback. Pills such as Vicodin and OxyContin enjoy widespread use, particularly among young people. While Richard Martinez hangs on to his job as basketball coach, he has grown to love tennis. “It’s a stress-reducer,” he admits. His two sons played for Wendall Barnett and his daughter now is now a member of the girls' team, which Martinez helps coach. Wendall Barnett did not grow up with a tennis racket in his hand. He was born in tiny Welborn, Kansas, then a farming crossroads of 500 people, now a part of Kansas City. His father built fire doors. Laid off during the Depression, the senior Barnett moved the family to California. 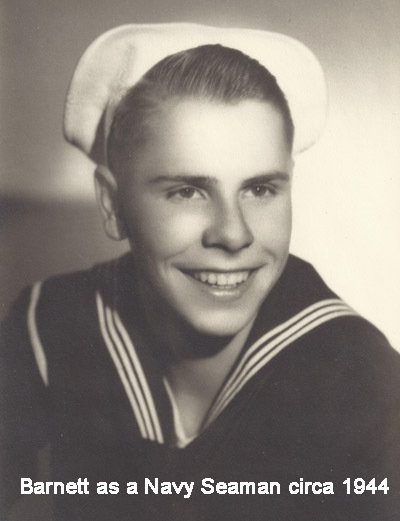 Young Wendall served in the Navy at the end of the World War II, but saw no action. After the war, he settled in an apartment in Chatsworth, California. He took a job driving a truck across Los Angeles for the 4-S Bakery. 4-S was a wholesaler who sold to restaurants and catering businesses. “It was a great job,” he says. It must have been, for he stayed 35 years. Did anything interesting happen while driving the truck? The apartment complex in Chatsworth had a tennis court and one day when he wasn’t at the wheel of his bakery truck, Barnett went out and hit tennis balls with a fellow who was hanging around the empty court. He kept at it, and eventually moseyed over to a popular public tennis venue on Ventura Boulevard and rallied with anyone available. He found a pro who gave him some tips. He never played tournaments, but he came to understand the game. He eventually taught privately for while. As he was winding down his career with the bakery, Barnett, with Frances’s encouragement, entered college at Cal State Northridge. He was 52 years old at the time. The memory causes him to roar with laughter. “Only a couple of my professors were older than I was.” He finished in 1985 with a degree in history and a minor in geography. In 1983, Barnett and Frances took a vacation to New Mexico. They stayed in Santa Fe and one day decided to drive up to Taos. As the couple motored slowly through Española on U.S. 285, the beauty and peace of the place grabbed them. “I wouldn’t mind living here,” Wendall said. The two returned to New Mexico in 1986 and bought a house in the Santa Cruz area. One day, Barnett asked a policeman if there were any tennis courts around. The cop pointed him toward the high school. The courts then were in respectable shape. The last ten years of Frances Barnett’s life were painful and burdensome. She experienced a raft of physical problems and did not leave the house. Frances died in 2006 of renal failure. She was 85. Wendall took care of her all of those ten years. Indeed, he did everything for her. He eventually stopped coaching girls and just concentrated on the boys. Eventually he watched helplessly as the tennis courts went downhill. He tried to overlook the problems. He put up with the conditions because he loved coaching. As ninth graders, Henry Talachy and Frankie Rendon a decade or so ago didn’t know a tennis ball from a ball of yarn. They knuckled down to become one of the district’s top doubles teams. Here and there an Española boy will go the state tournament. As a team, the boys have had a much rougher time. The Sundevils compete in a tough district, with Los Alamos and Santa Fe. The boys used to face Farmington. Never once in nearly two decades did the Española boys beat Farmington in a dual match. COUNTERPUNCHER is an exclusive online series written by Toby Smith, former Albuquerque Journal reporter, three-time USTA Southwest Media Excellence winner, and past Section Marketing Committee member. He also volunteers for USTA Northern New Mexico. 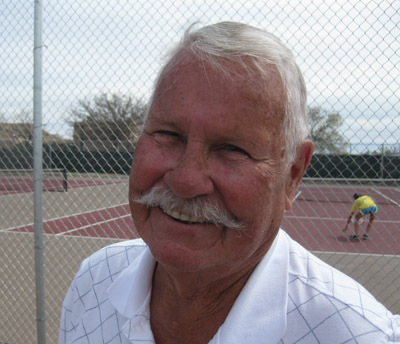 Smith knows the landscape of tennis well, especially here in the Southwest, writing on tennis for more than 40 years. To reach Toby or if you have a story idea, feel free to contact him at tobysmith68@gmail.com or 505-681-0667. View past Counterpuncher stories HERE.